I just went to my little plot at the community garden, and the base of the brandywine tomatoes were blackened. No doubt what it was: the dreaded blight. So I removed the plant, carefully putting it in the trash instead of the garden compost. Not clear yet whether Mr. Stripey is infected. The grape tomatoes are fine. I could think that this is a sign that I should start cutting down my nightshade vegetable intake to see if doing so will ease my arthritis, but it isn’t a sign. Even if it is not a sign, I can see whether being without the temptation of a luscious tomato crop makes it easier to shift my diet. I am grateful that I got such a wonderful harvest at the beginning of the summer, and I am doubly grateful that I am not dependent on just my own garden (or even on just local produce) to eat well. But for a few moments, I think I will just allow myself to be disappointed. A cool breeze is blowing through my window as I write, giving a foretaste of glorious fall weather to come. Although already fully immersed in the throes of work after last week’s study trip to Oregon with John Friend, I am brimming from the teachings and comraderie. Such a trip reminds me of how crucial it is to study and connect to help bring the benefits of yoga off the mat and into my daily life. This week is free class week at Willow Street Yoga. It is a great way to try out new classes or teachers or to bring friend who is been shy about starting or returning to yoga. I’ll be teaching both my 8:30am Level II and my noon Gentle and Therapeutics classes this Saturday, September 12th. Bring a friend and come check it out. Looking for an extra class or one great to bring a drop in friend? Come join us for the Tuesday night class at William Penn House. All levels of practitioners welcome. Special prices for public interest workers, students, and seniors. Looking Ahead: Already trying to make your Thanksgiving plans? If you will be in town, plan to share your gratitude at the 7th Annual Thanksgiving Day fundraiser for Oxfam, which I will be leading at the Willow Street Yoga Center’s Takoma Park studio. For more information on classes and workshops or to enjoy the blog, visit: www.rosegardenyoga.com or join me on facebook. In this society, we tend to think of softness as a negative. If being soft is collapse, laziness, inattentiveness, etc, then it would indeed be a hindrance to growth inner and outer. We need to soften, though, in order to open or change. When baking a cake, we allow the shortening to soften so that we can cream it with the sweetener. When a seed germinates or a fledgling emerges, the shell softens so that the new life can burst forth. When I soften as part of the first alignment principle, it is not a collapse, though it does have an aspect of easefulness. It is necessary to soften to invite the support of the subtle energies, to fully experience all the pose has to offer, to expand with light from the inside out. Softening when we start a pose is like the softness of early spring that allows the vigor of full growth to expand. Being soft in this way — on or off the mat — makes possible the growth of inner brightness and strength that actually makes us less vulnerable then would creating or keeping a hard and brittle shell that can bind or break. Yesterday at the Dupont Circle Fresh Farm Market I carefully selected four peaches that were not quite ripe. I anticipated them ripening on Tuesday and Wednesday, so that I could have them when I returned to the office (always good to have a special treat when returning to the office from vacation). By the time I got the peaches into the kitchen two hours later, three had ripened and gotten sufficiently bruised during the journey that they could not be carried to work. I used this as an opportunity to make a decision about what to bring to a potluck tonight: bruised peach cake. Cream shortening with sugar. Add in beaten eggs, yogurt, and juice. Mix well. Blend or sift all dry ingredients together. Mix dry ingredients into wet ingredients, taking care not to overmix. Blend in peaches and their juice. Turn batter into greased (butter or flavorless oil) 9×9 (or 8×8) baking pan. Put in 325F oven (no need to preheat) for 20-30 minutes. Check after 15-20 minutes to make sure not cooking unevenly or browning too quickly. Energy saving tips: (1) many non-yeast leavened baked goods do not need the oven preheated; (2) by baking bread-like cakes that are traditionally baked in a loaf shape in a square baking pan, oven time is reduced by more than half; (3) use the toaster oven so that you are not using more oven space than needed. Kashmir shaivism, using the term spanda, talks of the ultimate pulsation of life itself, all being a vibration, everything a play of opposites, a constant dance of concealment and revelation. Yesterday I when I went to see Ang Lee’s Taking Woodstock, I thought about about what a dance of moments, desires, emotions, motivations, opportunities, and relationships made Woodstock the phenomenon it became. I remembered when I was a teenager asking my mother why we had not gone; I had some idea that good family friends had made the trek from Long Island. She said it did not seem sensible to bring three girls under 10. I am sure that if we had gone, my memories would have been of being dirty, hungry, tired, wet, and overwhelmed. Instead, I grew up with the instant nostalgia of someone who was just a few years too young to make it up there on my own. In this contemplation, I marveled nearly as much at the play of spanda in my own life as in the world around me. I returned home last night from eight days away, five of which were truly on retreat — just meditating, bathing in hot springs, hiking, eating well, practicing yoga, and celebrating with dance and music. To see pictures, click here. The focus of the week was honoring the past and engaging in the present so as best to serve the future. We left Breitenbush Hot Springs mid-afternoon on Thursday. Rather than take a red eye, I stayed Thursday night at an airport hotel and took an early morning flight home on Friday. I woke early Friday morning and rested in meditation to ease the shock of going from an off-the-grid community in the forest to an airport hotel. 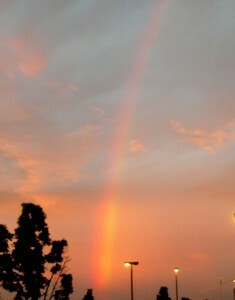 This rainbow glowed over the airport while I was waiting for the hotel shuttle to take me there for my flight. The rainbow reminded me to carry the deep joy of the retreat home with me. Yesterday morning, when I was starting to pack to leave for Oregon today, the most critical elements for getting ready (after making sure I had my wallet, camera, and some yoga clothes in a suitcase) were to water the garden well, pull some weeds, pick ripe vegetables, and cook. I’d given away some produce a couple of days ago, but still had eggplants, peppers, tomatoes from the garden and half an onion from something I had cooked earlier in the week. I cut everything in half, slathered it in olive oil, sprinkled the vegetables with coarsely ground pepper Himalayan pink salt and put it into the toaster/convection oven (my favorite kitchen appliance). The vegetables roasted while I was doing other chores. Now, on my return, I will be able pull from the freezer ingredients for a wonderful pasta sauce. As much as I am looking forward to a week of yoga and exploration, I’ll be delighted to come back to garden and my own kitchen. It is almost time to start planting greens, beets, and turnips for fall. I hope you are having a rich and full summer. To celebrate the yoga with John Friend, the delightfulness of the Pacific Northwest, and to get a break from routine — in a word to take a vacation — I will be out of town next week. While I am on break (September 1st and 2nd), no Wm Penn or house classes. They resume as usual on Tuesday, September 8th. There are wonderful subs for Willow Street classes this Saturday, August 29th, but there are no classes at Takoma Park, Willow Street, Labor Day weekend (Saturday, September 5th). Upcoming: Free class week at Willow Street on September 12th. Start of the new session September 19th. Tears welled up this morning in sadness and honor with the news of Ted Kennedy, an incredible example of a life of service.